A Big Mac has 540 calories, 10 grams of saturated fat and 0.5 grams of trans fat. 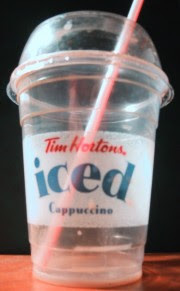 What wonderful new Tim Horton's beverage has more calories, more saturated fat and more trans fat than the Big Mac? The winner is, Tim Hortons 18oz Butter Caramel Iced Capp Supreme! With 560 calories, 17 grams of saturated fat and 1 gram of trans fat it's a tall, cold glass of why it is we absolutely need calories posted on menu boards. Hat tip to CSPI for raising the red flag.